AnticStore > Catalogue > Paintings & Drawings > 17th Century Oil Painting > 17th century > Lucas Achtschellinck 1626-1699 (Awarded to) - River landscape. 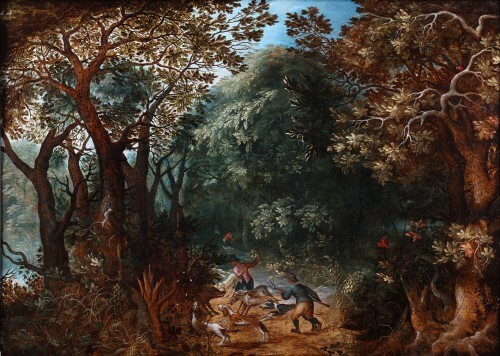 "River landscape bordered by an animated forest of shepherds with their flock"
Painter of religious compositions, portraits, animated landscapes, landscapes. One feels in the lightness of his trees, in the right observation of values, that the artist was formed especially in the study of nature.